Tumi Ferrer is Head Trainer at Te og Kaffi, who are a leading roaster in Iceland and an IKAWA customer. He also happens to be Iceland’s Brewers’ Cup Champion, and competed in Dublin World of Coffee in the World Brewers Cup competition last month. We saw a lot of Tumi during the World of Coffee event, as he was roasting his competition coffee on the IKAWA Pro Sample Roasters we had on our stand, to make the coffee as fresh as possible, the day ahead of the competition! Tumi has been kind enough to share some insight here, as well as his competition roast profile which is below. "We use the roaster at Te og Kaffi when we receive samples and are evaluating coffees to buy. We also lay out some blueprints of how the coffee should be roasted on the production roaster using insights from charge temp, approx. 1st crack temp, Development Time Ratio (which are on the IKAWA Pro App) – this allows us to plan the production profile before we start roasting. It has saved us a lot of cost, and given us more freedom to explore the possibilities of each green coffee. For my World Brewers Cup presentation, I received a few dozens of samples, all of them splendid coffees. I roasted all of them on the IKAWA Pro and then cupped them and eventually chose a brilliant coffee from Sidamo, Ethiopia, from a coop called Hunkute. Roasting all of these samples was a really good practise for me in understanding the essentials in roasting, and the consistency and reliability of the IKAWA helped me make sense of which changes led to a particular outcome. I would normally use the IKAWA for sample evaluation and flavour profiling, but for the Brewers Cup I decided to roast my competition coffee on the IKAWA too. I realised the whole time that I was taking a big risk by roasting freshly for the competition. I practised at home with the coffee as fresh as 1 hour off roast to give me an idea of what to expect." 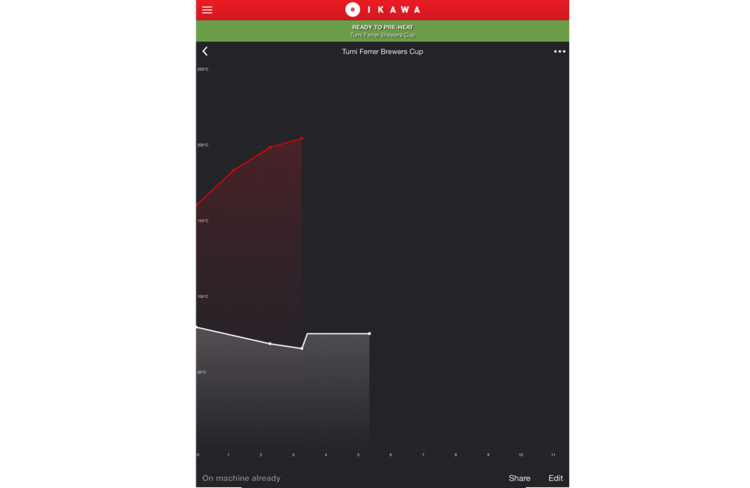 This is Tumi's roast profile on the IKAWA Pro App, to open it, you will need to view from iPad / Phone with our app installed. "To my surprise, it worked really well. The coffee was super aromatic and together with the high Total Dissolved Solids and low extraction percentage combination that I was going for, the Hunkute proved to be super juicy, sweet with a lot of citrus and floral notes." Tumi explains more about the theory behind this during his presentation, which you can watch in full on the video below. "When I arrived in Dublin, I tested my normal roast profile on the IKAWA Pro Sample Roasters on the IKAWA stand at the event. I realised the atmospheric conditions there were having a slight effect on the flavour of the coffee I was roasting, but after tweaking the roast a little bit I was able to get the same flavours I got at home." With this in mind, we’d love to hear from anyone else with Hunkute, or a similar washed Sidamo coffee how you find this profile.